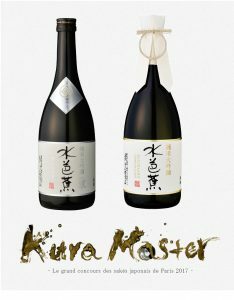 KURA MASTER | Nagai Sake Inc.
Mizubasho Sake won the two Platinum Awards at Kura Master 2017 The Kura Master contest took place for the first time in France, thirty-five professionals in the French Restaurant industry, including top sommeliers in France, tasted 550 sake brands from across Japan. And they chose top five brands each in the “Junmai” and “Junmai daiginjo” categories. The results of the competition was announced on July 11th, and “Mizubasho Junmai daiginjo Sui” won one of the top five Platinum Awards, and also “Mizubasho Junmai Daiginjo” won the platinum Award in the Junmai daiginjo category. The Kura Master contest was designed to choose Japanese sake brands suitable for the French Market by French industry professionals. We are very happy and honored about getting such great recognition, and keep our best to increase sake lovers all over Japan and around the world! The results of the Competition(in French). The Best brand of the competition will be announced in October. Please cross your fingers for us!